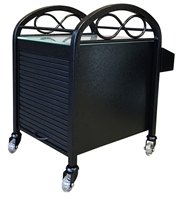 Our Publik Pedi Trolley with 3 drawers is perfect for your salon, spa, etc. needs. The top features a space to sit the drawer in use. The sides have 4 accessory trays with built in appliance and brush holders with removable cups. This cart has easy open drawers providing easy access to all your styling needs from both sides. Nail Trolley is perfect for your nail salon, spa, etc. beauty needs. The top features a stylish nail polish rack to display your stock. 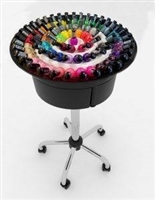 This cart has a 360-degree rotation providing easy access to all your nail needs. The Dayton Pedicure Stool is an elegant and sophisticated pedicure stool.